Dengue is now established as one of the most important arboviral infections. As the epidemic continues unabated globally, this Aedes mosquito-transmitted pathogen is considered a major re-emerging tropical disease and significant public health concern. Four well-established distinct serotypes of dengue virus, with a fifth one recently proposed, are responsible for causing a spectrum of clinical symptoms in humans ranging from mild fever to severe haemorrhagic manifestations. Indigenous cases of dengue were first recognised in Nepal, a Himalayan country bordered by India and China, just a decade ago in a cluster of tropical and subtropical areas. Subsequently, the range of infection has extended all over the country and now comprises not only low lying regions, but also hilly locations including the capital city Kathmandu. The two major epidemics to date, in 2010 and 2013, have demonstrated the capacity of infection outbreaks to be explosive and challenging to currently available disease control measures. There is a pressing need to undertake effective vector surveillance studies supported by provision of well-equipped diagnostic virology laboratories. However, sincere efforts are being made to map the nationwide prevalence and understand the epidemiology of dengue infection. Yet, the precise burden of dengue in Nepal remains unknown, since most reports are confined to economically affluent areas and do not account for regions of relative social deprivation in which disease is more likely to occur. This review presents a current overview of dengue in Nepal and discusses future prospects for control of this debilitating disease in the country. Visceral leishmaniasis (VL), caused by the Leishmania donovani complex, is a vector-borne systemic disease, with a worldwide distribution causing high morbidity and mortality in the developing world. VL patients may be asymptomatic or they may present symptoms and findings of a systemic infection. The positive predictive value of clinical diagnosis in patients with typical symptoms is usually high, but more often, the signs and symptoms are inconclusive and mistaken with other co-endemic diseases. The fact that HIV co-infections often produce atypical presentations and the heterogeneity of Leishmania species, which is common in many endemic regions, also complicate the diagnosis. Despite that, some of the parasitological methods are still considered to be the reference standard for VL diagnosis due to their specificity. The development of serological and molecular tests has further enhanced the diagnostic approach of VL. Recombinant antigens have improved the performance of serodiagnostic tests, with DAT and the rK39 antigen based immunochromatographic test being the most appropriate methods for the serological diagnosis of VL. Molecular techniques, despite the fact that their implementation is often difficult and infeasible, have become increasingly relevant due to remarkable sensitivity and specificity, and to the variability of tested samples. Quantitative polymerase chain reaction (qPCR) has been shown to be superior than conventional PCR for the differentiation between active VL and asymptomatic infections, such as for the detection of VL-HIV coinfection. This review summarizes the available methods with their applications in the diagnosis of VL, and focuses on the recent developments in VL diagnostics. Background & objectives: Aedes aegypti is a domestic mosquito and one of the primary vectors for dengue and yellow fever. Since, it is a vector of deadly diseases, its control becomes essential. Medicinal plants may be an alternative to adulticidal agents since they contain rich source of bioactive compounds. This study was designed to determine the adulticidal activity of Spondias mombin leaf methanol crude extract, n-hexane, dichloromethane and ethyl acetate fractions against female adults of Ae. aegypti mosquitoes and isolate active compound(s) responsible for the bioactivity. Methods: All leaf extract and fractions were evaluated for adulticidal activity against Ae. aegypti mosquitoes. Adult mortality was observed after 24 h of exposure. The dichloromethane fraction was further purified being the most active fraction using silica gel column chromatography and the active compounds were identified with the aid of HPLC and LC-ESI-MS/MS. The LC50 and LC90 were determined by Probit analysis. Results: Dichloromethane fraction was the most effective fraction with LC50 value of 2172.815 μg/ml. Compounds identified were mainly ellagic acid and 1-O-Galloyl-6-O-luteoyl-α-D-glucose. Interpretation & conclusion: The S. mombin leaf extracts and fractions proved to be a strong candidate for a natural, safe and stable adulticide, alternative to synthetic adulticide. Background & objectives: Long-lasting insecticidal net (LLIN) is considered to be a highly effective intervention against malaria under National Vector Borne Disease Control Programme in India. A cross-sectional study was undertaken to assess the coverage and utilization of LLIN and the factors related thereto. Methods: A survey of 1300 households was carried out in Ranibandh block of Bankura district in West Bengal, India, using lot quality assurance sampling (LQAS) method. Coverage/utilization of 80% was considered as minimum acceptable norm. The weighted sample size was calculated from each village of the block. The sociodemographic, economic information of the household along with the availability and use of LLIN was collected through interview and observation. Results: In total, 7320 individuals including 840 children ≤ 5 yr were visited. Overall coverage of adequate LLIN was 65.4% (± 1.5%) and for children ≤ 5 yr, it was 60.5% (± 1.3%). Overall, 66.1% (± 1.4%) people of all ages and 63.7% (± 1.4%) children ≤ 5 yr slept under LLINs in the night before the survey. Out of 26 sub-centres, distribution of LLINs in 10 sub-centres was below the accepted norm, whereas utilization was sub-optimal in 19 sub-centres. In only 18.2% (± 0.5%) households, LLINs remained hanging during daytime. Poverty, caste, education, perception regarding malarial morbidity and preventive action of LLIN were associated significantly with the distribution of LLIN. Similarly, poverty (AOR = 2.14), threat perception regarding malarial morbidity (AOR = 1.51) and mortality (AOR = 2.52) were positively associated with the use of LLIN. Full utilization of bednets by under-fives of the households was higher in villages with sub-centres. Interpretation & conclusion: Around two-third population of the study area was effectively covered with LLIN. Higher proportion of socially marginalized people received LLIN. Threat perception regarding malaria was directly associated with both receipt and use of LLIN. Behaviour change communication on utilization along with adequate access to LLIN needs to be strengthened. Background & objectives: Rapid diagnostic test (RDT) kits are widely used in India for the diagnosis of dengue infection. It is important to evaluate the validity and reliability of these RDTs. The study was aimed to determine the sensitivity, specificity and predictive value of four commercially available RDTs [Panbio Dengue Duo cassette, Standard Diagnostics (SD) Bioline Dengue Duo, J. Mitra Dengue Day-1 test and Reckon Dengue IgG/IgM] against composite reference criteria (CRC), and compare the cost of the tests. Methods: In this prospective observational study for diagnostic accuracy, we tested stored blood samples from 132 cases of dengue and 149 controls of other infections as classified based on CRC, with all the four RDTs. The CRC was based on the epidemiological considerations, common clinical features and laboratory abnormalities. The non-dengue controls were the cases of proven alternative diagnosis. The diagnostic performances of the tests were compared in terms of sensitivity, specificity and predictive value along with the cost involved per test. Results: The sensitivity of the Panbio and SD RDT kits was found to be 97.7 and 64.3% respectively, and the specificities were 87.8 and 96.6% respectively. The sensitivity of the NS1 antigen capture by SD Duo, Reckon, J. Mitra RDTs was 20.9, 18.6 and 27.1% respectively. The prevalence of dengue specific IgG antibody with Panbio RDT kits was 49.3%. The cost per test for Panbio, SD, Reckon and J. Mitra is US$ 6.90, 4.27, 3.29 and 3.61 respectively. Conclusion: It was concluded that in dengue outbreak, Panbio IgM capture RDT alone is reliable and easily available test which can be used in acute phase of dengue infection in any resource limited set up. NS1 capture rates by any of the other three RDTs might not be reliable for the diagnosis of acute dengue infection. Background & objectives: Artificial water-holding containers (AWHCs) have been well-documented in many Aedes aegypti studies for dengue surveillance and developmental research. Hence, we investigated the role of different AHWCs on the development and ecdysis period of Ae. aegypti dengue vector, a container breeding mosquito. Methods: Nine types of AWHCs, namely glass, polystyrene foam, rubber, steel, porcelain, plastic, aluminum, clay and concrete, were chosen for the study. All AWHCs were subjected to the developmental assay for an observation period of 10 days. Regression and hazard analyses were employed to the developmental stages and the characteristics of the AWHCs. Results: The observations revealed that Ae. aegypti development is fastest in glass and polystyrene containers while slowest in concrete containers. Moreover, pupal ecdysis appears to be the most affected by the characteristics of the AWHCs based on regression and hazard analyses. Interpretation & conclusion: Characteristics of the container that can regulate water temperature seem to be the driving force with regards to the slow or fast development of Ae. aegypti, more notably in pupal ecdysis. The results of the study further strengthen our understanding on the dynamics of Ae. aegypti's developmental biology to different characteristics of artificial water containers. This, in turn, would aid in devising vector control strategies against dengue especially in endemic areas. Background & objectives: Generally, indepth understanding of the epidemiology of malaria is considered a prerequisite for planning effective control measures in the endemic regions like sub-Saharan Africa. 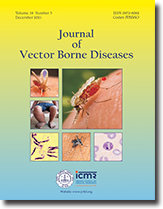 This study focuses on the relationship of entomological inoculation rates (EIRs) to malaria incidence and prevalence rates across eco-vegetational zones in Bayelsa State, Nigeria. Methods: Mosquito sampling was undertaken in seven towns/villages in seven local government areas (LGAs) in three eco-vegetational zones. Adults were collected twice quarterly by the pyrethrum spray catch (PSC) technique. Anophelines were separated morphologically and the sibling species were identified using PCR. Detection of circumsporozoite (CS) antigen by ELISA was used for determining mosquito infection rates. Man-biting, sporozoite and entomological inoculation rates were calculated by standard methods. Simultaneously, malaria incidence and prevalence rates were calculated using data obtained from hospitals and by examination of blood smears from consenting adults. Results: The estimated mean man-biting rate (MBR) over a 2-yr period was 6.88 bites/person/night. The highest MBR of 16.9 was in the mangrove coastal water forest and the least, 11.3, was in brackish water swamp forest; differences were significant (t = 12.083; p<0.05). The mean sporozoite rate of Anopheles gambiae sensu lato (s.l.) was 11%. The highest mean sporozoite rate was 13.4% for An. gambiae sensu stricto (s.s.), followed by 7.9% for An. arabiensis and the least was 0.4% for An. melas. Seasonal rates varied, highest for An. gambiae s.s. in the dry season, but highest for An. arabiensis in the wet season. The annual entomological inoculation rate of An. gambiae s.l. over a 2-yr period was 80.50 infective bites/person/year; the highest, 70.35 was in An. gambiae s.s. and the least, 0.15 in An. melas. When prevalence (PR), incidence (IR) and entomological inoculation (EIR) rates were incorporated in a logistic regression model, they showed 70.5 and 64% accuracy in predicting the relationship between EIR and, incidence and prevalence rates respectively. Interpretation & conclusion: Based on EIR values malaria transmission was classified as stable when EIR was >1.5 or unstable when EIR was ≤ 1.5. Although, earlier studies have shown correlation between EIRs and malaria PR, this study demonstrated a significant correlation between EIRs and malaria incidence rates. Background & objectives: Malaria is a serious disease which has repeatedly threatened Andaman, an island territory of India. Uncharted dense vegetation and inaccessibility are the salient features of the area and the major areas are covered by remotely sensed data to identify the malaria vector's natural habitat. The present investigation appraises the role of geospatial technologies in identifying the natural habitat of malarial vectors. Methods: The base map was prepared from Survey of India's toposheets, the landuse map was prepared from indices techniques like normalised difference vegetation index (NDVI), normalised difference water index (NDWI), modified normalised difference water index (MNDWI), normalised difference pond index (NDPI), and normalized difference turbidity index (NDTI) in conjugation with visual interpretation. The soil moisture content map was reproduced from the soil atlas of Andaman and Nicobar Islands followed by generation of an aspect profile from ASTER-GDEM satellite data. Both the landuse map and aspect profile were validated for accuracy in the field. Results: A weighted overlay analysis of the classes like landuse, soil moisture and aspect profile of the study area resulted in identification of the potential natural habitat map of malaria vector surrounding the areas of Tushnabad, Garacharma, Manglutan, Chouldari, Ferrargunj and Wimberlygunj hamlets. Interpretation & conclusion: The natural habitat of malaria vector indicated that Tushnabad, Garacharma, Manglutan, Chouldari, Ferrargunj and Wimberlygunj hamlets are within the proximity of 2.5 km from the prime habitat location with more number of malaria positive cases. Also these hamlets are surrounded by dense evergreen forest and the land surface is draped by clay loam and clay soil texture exhibiting high soil moisture content warranting high rates of survival and proliferation of the vector ensuring resurgence of malaria every year. It is thus concluded that application of geospatial technologies plays an important role in identifying the natural habitat of malaria vector. Background & objectives: Malaria is one of the leading public health challenges in Ethiopia. To address this, the Federal Ministry of Ethiopia launched a laboratory diagnosis programme for promoting use of either rapid diagnostic tests (RDTs) or Giemsa microscopy to all suspected malaria cases. This study was conducted to assess the performance of RDT and influencing factors for Giemsa microscopic diagnosis in Amhara region. Methods: A cross-sectional study was conducted in 10 high burden malaria districts of Amhara region from 15 May to 15 June 2014. Data were collected using structured questionnaire. Blood samples were collected from 1000 malaria suspected cases in 10 health centers. RDT (SD BIOLINE) and Giemsa microscopy were performed as per standard procedures. Kappa value, logistic regression and chi-square test were used for statistical analysis. Results: The overall positivity rate (PR) of malaria parasites by RDT and Giemsa microscopy was 17.1 and 16.5% respectively. Compared to Giemsa microscopy as "gold standard", RDT showed 83.9% sensitivity and 96% specificity. The level of agreement between first reader and second reader for blood film microscopy was moderate (Kappa value = 0.74). Logistic regression showed that male, under five year of age and having fever more than 24 h prior to malaria diagnosis had statistically significant association with malaria positivity rate for malaria parasites. Interpretation & conclusion: The overall specificity and negative predictive values of RDT for malaria diagnosis were excellent. However, the sensitivity and positive predictive values of RDT were low. Therefore, in-service training, quality monitoring of RDTs, and adequate laboratory supplies for diagnostic services of malaria would be crucial for effective intervention measures. Background & objectives: The recognition of communities of arthropods with medical importance in natural systems constitutes an important step in the prediction of possible epidemic events and/or emergence of infectious diseases in the human population. This is due to anthropogenic impact in natural areas and landscape modification, which changes the dynamics of pathogenic agents, reservoirs, and vector insects. In this study, an inventory was compiled of species of the genus Lutzomyia present in sub-Andean forest from the confluence of the Pamplonita River basin. Methods: CDC-light and Shannon traps were used for collecting adult phlebotomine sandflies during the month of October 2013 in a sub-Andean forest from river basin Pamplonita. All specimens were identified using morphological keys. The epidemiological relevance of each species was reported using a literature review about natural infection or vector incrimination with Leishmania species or other pathogens microorganism. Results: A total of 2755 specimens belonging to eight species of the genus Lutzomyia were collected. Out of the eight species, seven belonged to the group verrucarum (Lutzomyia sp - townsendi series, L. ovallesi, L. spinicrassa, L. serrana, L. townsendi, L. nuneztovari and L. pia), while one belonged to the subgenus Helcocyrtomyia (L. hartmanni). A new registry of L. townsendi was observed for the Norte de Santander department. Interpretation & conclusion: The appreciable diversity of the verrucarum group observed in this area suggest further investigation on the biogeography and evolution of this group, and epidemiological risk for human populations around this area, as there are reports of Leishmania natural infection and favourable conditions for domestication of phlebotomines in rural towns.